Dragon’s T-34/85 is a mixed beast that feels like it comes from a completely different kit from the other Dragons I’ve built. 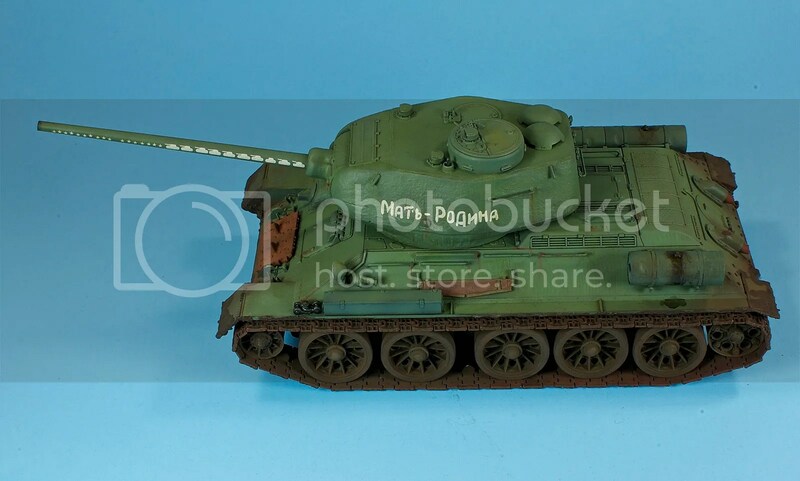 Next to the Panzer III and Panzer IV, the parts count on the T-34 is miniscule, downright Tamiya-like, and the detail just isn’t as strong as on what I’m assuming are more recent moldings. That said, it builds up quickly and pretty easily. I had one gap at the rear deck that was easily filled with a thin strip of styrene. Of the four tanks I built up in September and early October, the T-34 was the second most enjoyable build (after the masterful Tasca M4A3(76)W). Marking and scheme-wise, there’s just not much to the T-34, so not much worth commenting on, but it makes a great canvas for weathering. 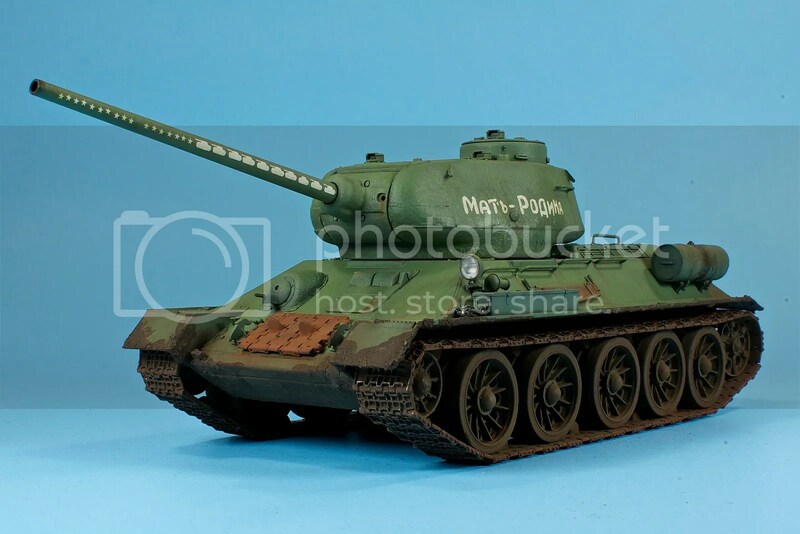 If you want an insane T-34/85, I’d probably suggest looking at AFV Club’s kit, but Dragon’s offering is definitely a solid, simple offering that does not disappoint. Doogs, another well done beautiful build. I do have one question though. Could you explain your thought process on the weathering a bit. I see a wet mud effect on the hull and fenders, but don’t see any on the tracks and running gear. Am I missing it? What did you have in mind? Did Nolan have a good Christmas? I bet he played with the boxes more than the toys! Nolan had a great Christmas…he got a big wheel by Razor that, instead of fat plastic tires on the back, has castering rollerblade wheels, so it can go into some crazy spins. He’s not quite big enough to do too much with it yet, but he’s been having a blast rolling down the driveway and spinning out in the cul-de-sac. 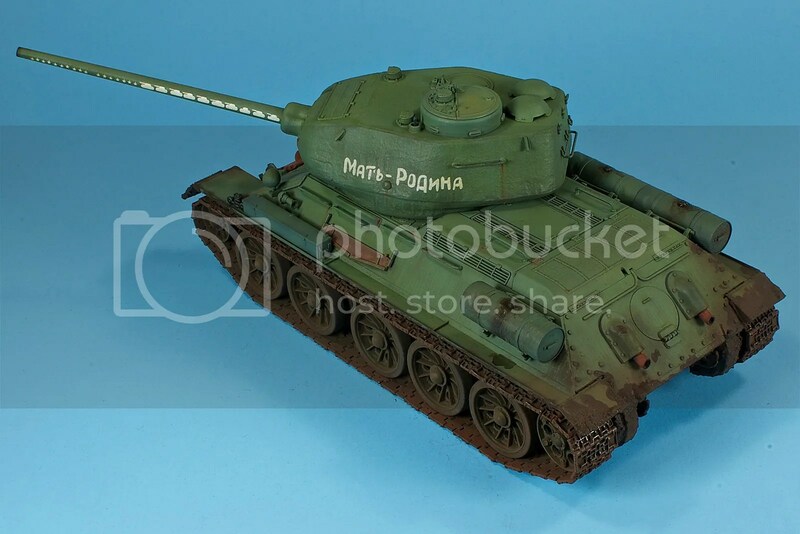 As for the weathering, the idea is that the T-34 ran through some mud some days earlier…the worst of it has dropped off, especially on the running gear and tracks, but the stuff on the fenders and front and rear hasn’t all dropped off. I overcoated it with Vallejo matte varnish and some additional Russian Earth pigment to flatten it out. Think next time I’ll try to take it lighter. First of all – a very nice built! 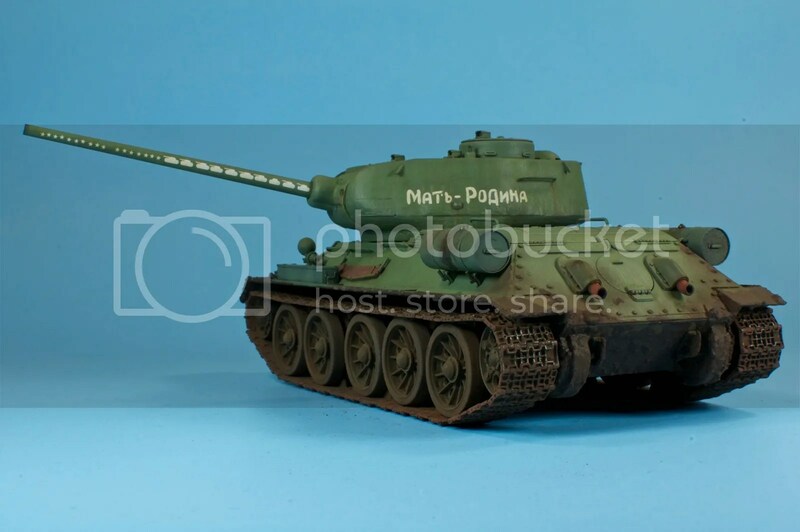 A T34 with this decal had only one of a kind real prototype with a story, did u use it’s photo’s (because its kinda hard to find those anywhere) or is it just a collective image of soviet T34 ?